After complaining about meetings without veggie lunch options, I must also report two positive meetings I attended this week. The first one was a presentation of a project called The BlueCall Phone by Ithaka, a centre coaching people with a handicap. Part of the centre is an Oxfam Wereldwinkel, a shop selling fair trade products. It was an early breakfast meeting and Oxfam fair trade coffee, tea and orange juice were served! Today I had a meeting at TU Delft‘s Studiolab. We had lunch in one of the faculties’ restaurants. Of course I should have brought my own lunch, but I find that a bit difficult, as I never know beforehand what the others’ plans are for lunch. I don’t want to be a killjoy. So. We went to the restaurant where I tried to assemble a sustainable lunch. I didn’t take any of the pre-prepared and pre-packaged salads or sandwiches, but took a unpackaged sandwich, some butter and some cheese. And a bowl of soup. I was happy to find organic butter milk (all dairy was organic). I was slightly less happy to find disposable plates, cups, bowls and forks, knives and spoons. 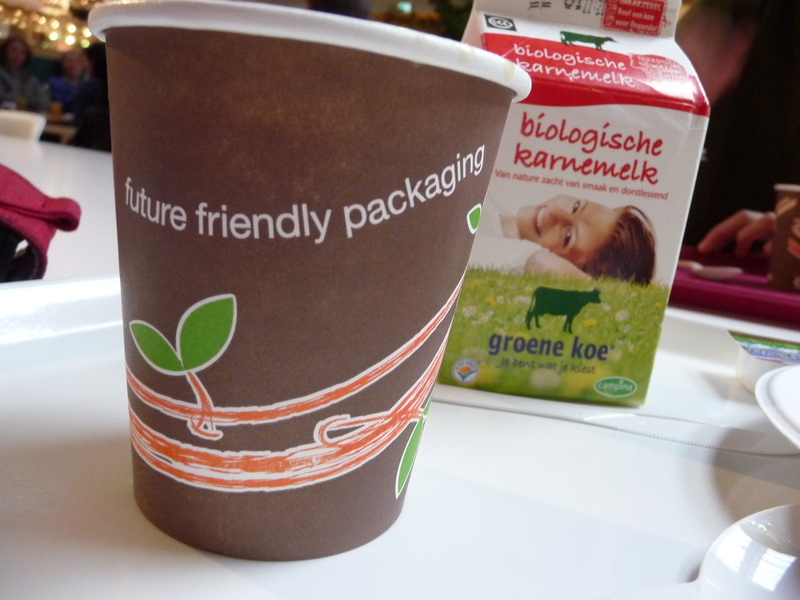 However, all plates, bowls and cups had a sign saying “future friendly packaging”. No clue what that means exactly, but at least the restaurant tries to be more sustainable I guess! 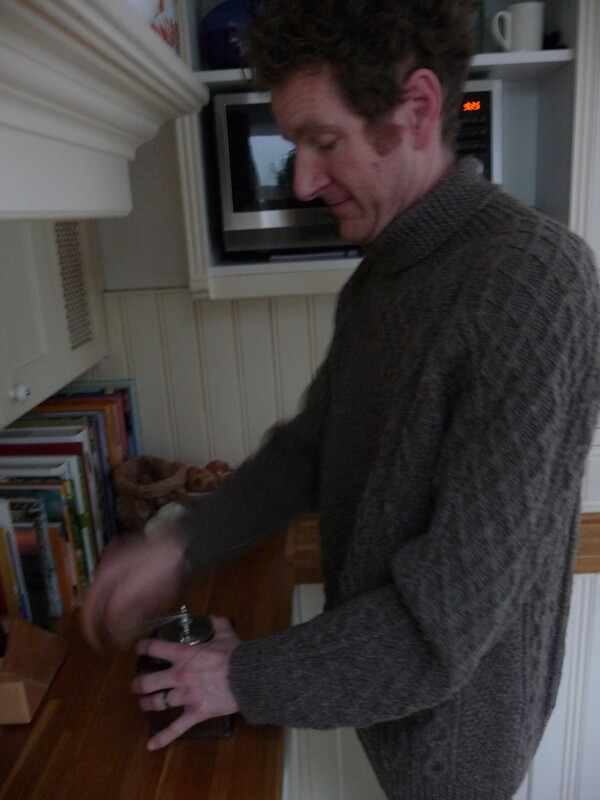 Eise, quite correctly, thought that we should grind coffee manually again, in stead of electrically. We used to do this for a while, but a few years ago we bought a good electric coffee grinder. 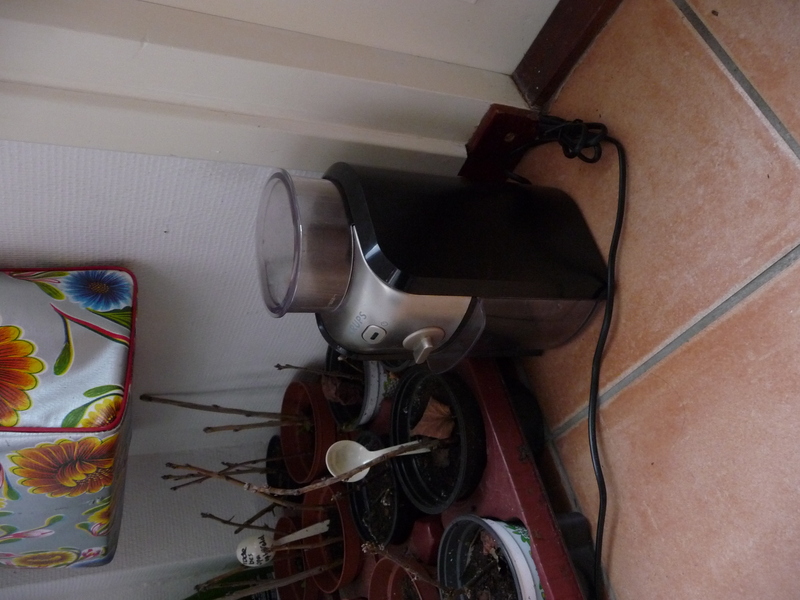 Which we will put away for a year now… Fortunately, we did save the manual grinder!